VACTERL is a rare, non-random association comprising at least three major component features defined by the acronym, and including Vertebral anomalies, Anorectal malformations, Cardiac defects, Tracheo-oEsophageal fistula with or without oesophageal atresia (TOF/OA), Renal abnormalities and Limb anomalies. The aim of this study was to compare the post-operative outcomes following surgical correction of TOF/OA in infants with VACTERL and isolated TOF/OA. 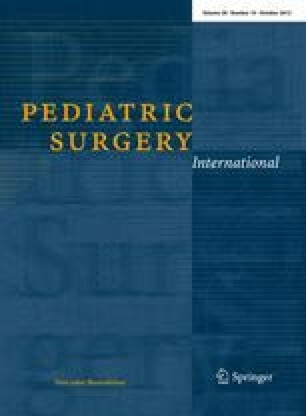 A retrospective case–control study comparing infants with VACTERL (case group) versus infants with isolated TOF/OA (control group) that underwent surgical correction of TOF/OA at our centre between January 2006 and December 2011. Patient demographics, types of anomalies, operative techniques and post-operative outcomes were collected using inpatient and outpatient records. We identified 30 consecutive infants with TOF/OA. Five infants had VACTERL (17 %) and 15 infants had isolated TOF/OA (50 %). There was no significant difference in the gestational age (P = 0.79), birth weight (P = 0.69) or operative repair (P = 0.14) between groups. Overall, surgical correction of TOF/OA led to satisfactory morbidity. Infants with VACTERL were not at higher risk of post-operative complications, such as oesophageal stricture (P = 0.17) or gastro-oesophageal reflux (P = 1.0), compared to infants with isolated TOF/OA. VACTERL association does not increase the risk of post-operative complications following TOF/OA repair.